Express your creativity with this synth-style controller. 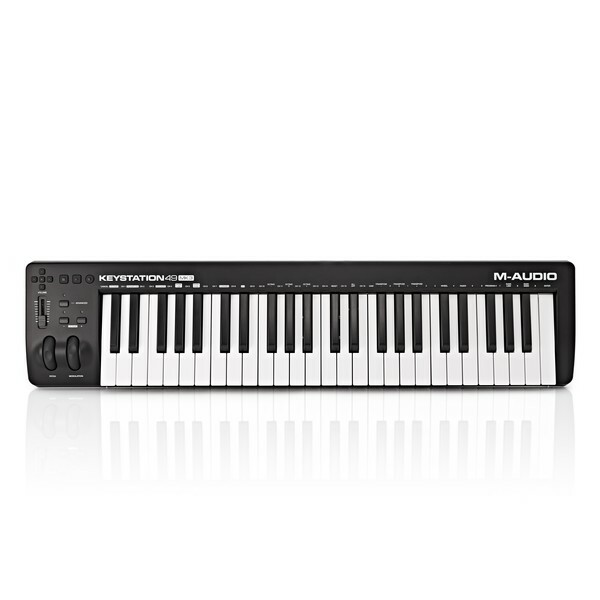 The M-Audio Keystation 49 MK3 USB Controller is the third addition to the immensely popular Keystation series. It is revered in the production world for its streamlined design and seamless integration with DAWs. The 49-note keybed features velocity-sensitive keys, providing a natural feel and fluid playability. It also includes transport control for controlling music software/DAW (digital audio workstation). It comes complete with a comprehensive software bundle including Pro Tools First, Ableton Live Lite and premium-grade virtual instruments. 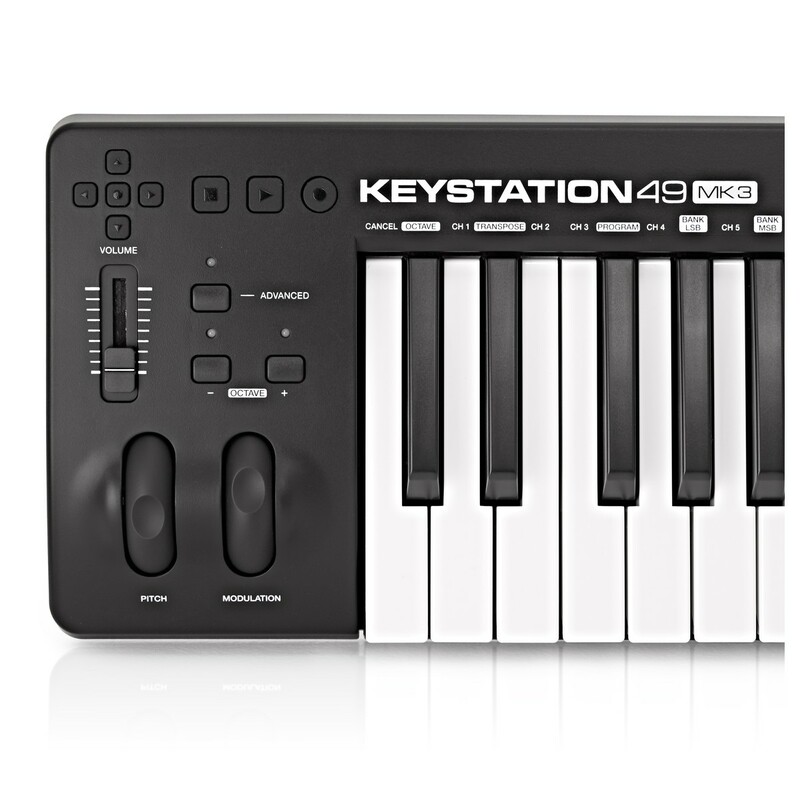 The Keystation 49 MK3 builds on the success of the two previous versions. 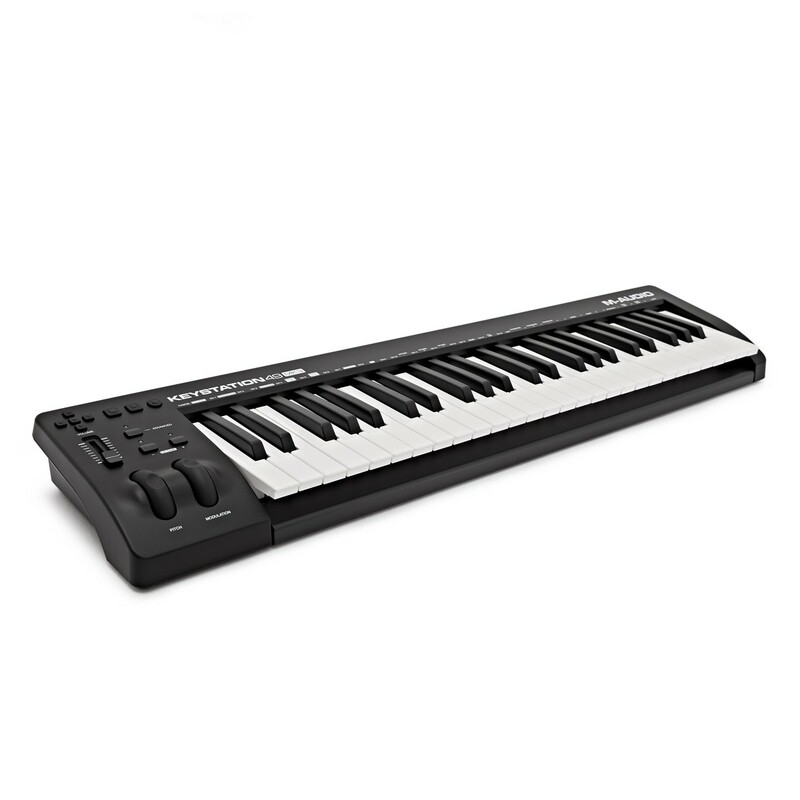 Keystation has long been a favourite of all digital musicians, thanks to its affordable price and high functionality. 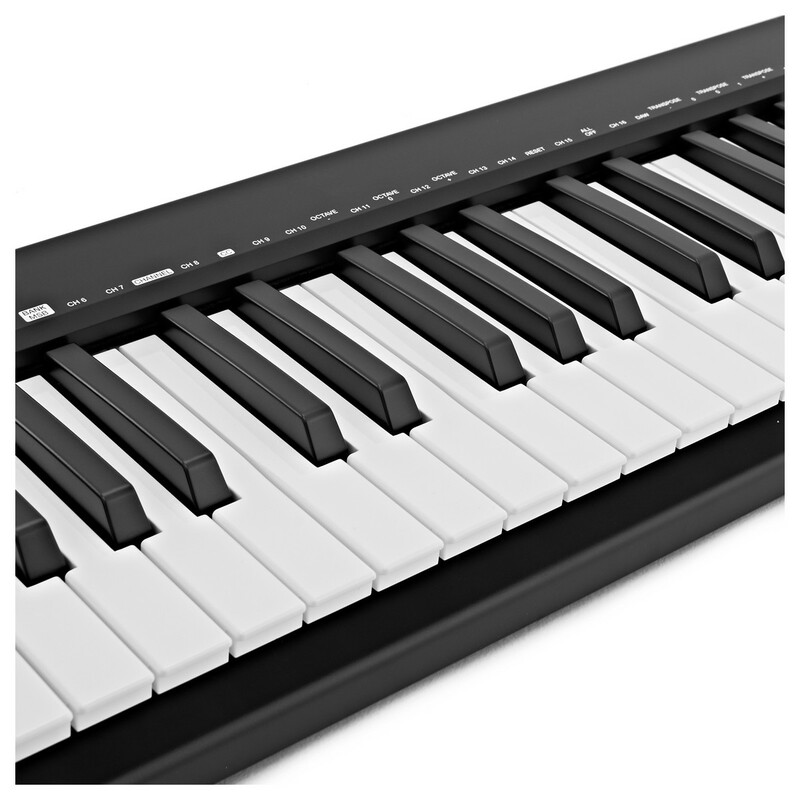 The 49-note keybed features velocity-sensitive synth-action keys. This provides a natural feel for all players no matter your skillset. It also feels great for piano players wanting to make the leap to digital music production. The ergonomic design features highly responsive pitch and modulation wheels. The pitch wheel can be used to affect the pitch of your sound while playing. The modulation wheel is used for modulating your sound with in-program effects. It includes a USB-MIDI connection for playing virtual instruments, recording melodies and controlling recording software. The controller is purposely designed to work in conjunction with digital audio workstations and music software. 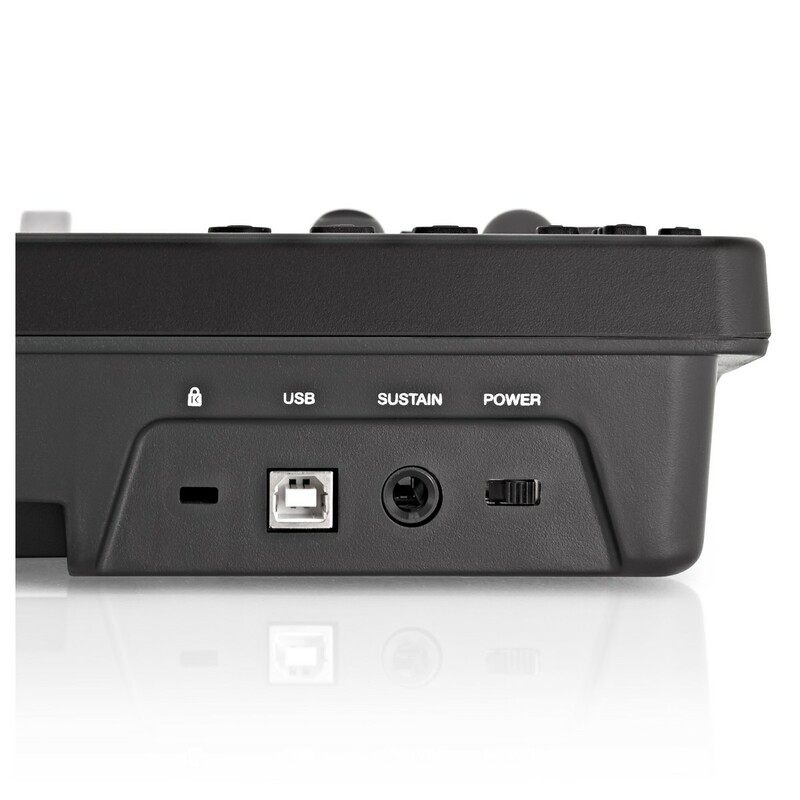 The keystation includes additional controls designed to communicate directly with your music software. Transport controls are included for quick and easy navigation when recording melodies and sounds. Stop, Play, Record, Up, Down, Left, Right buttons allow you use the keyboard as your main production hub, minimising the need to switch to your computer mouse and keyboard. A volume fader is also included for controlling the volume on your virtual instruments and other sounds. Advanced functionality gives you the ability to customise the controls on the keystation. For example, you could customise the pitch and mod wheels to control the velocity of your drums for more expressive automation. Pro Tools has long been the industry standard when it comes to creating, mixing and mastering professional music. M-Audio have now included a copy of Pro Tools | First with all keystation controllers. It combines the award-winning studio hardware with an easy-to-use DAW. It includes hundreds of virtual instrument sounds, 500MB of loops and premium-grade effects. Xpand!2 is a multitimbral workstation offering four active sound slots, or parts, per patch. Each part is provided with its own MIDI channel, Note Range (Zone), Mix, Arpeggiation, Modulation, and Effects settings-an excellent method for creating individual parts. Harnessing the four parts together to build one amazing Patch is where Xpand!2 reveals its true power. 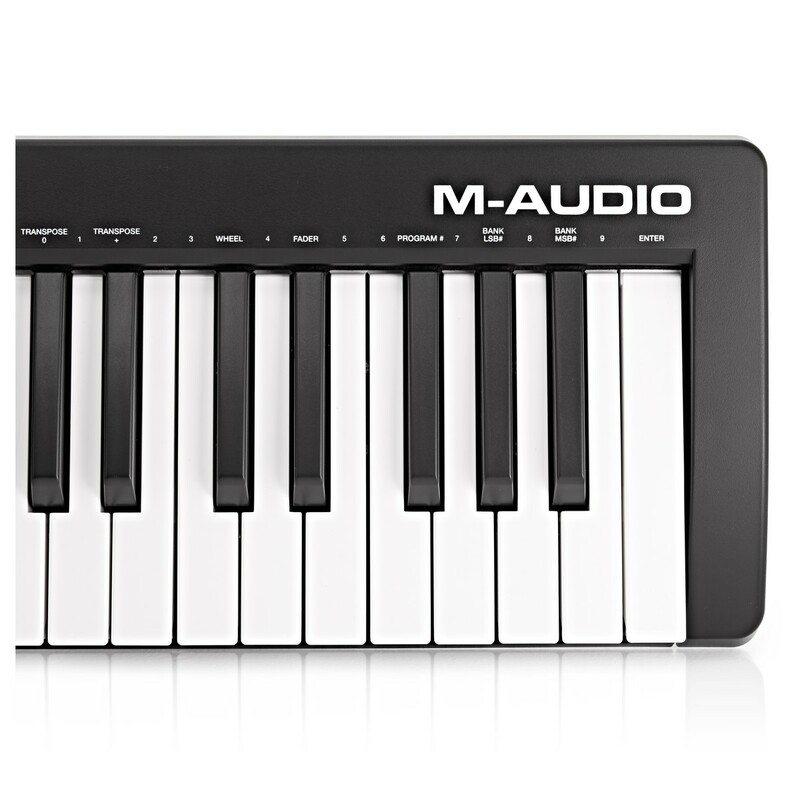 In addition to the sound library and integrated loops, the M-Audio comes complete with two great-sounding piano VSTs. Velvet is a virtual electronic piano featuring five infamous pianos from the 60s and 70s. Creative FX Collection – A collection of AIR Music Technology’s twenty classic AIR FX plugins, now available in AU/VST formats. Also included is the Mini Grand virtual instrument. Mini Grand features premium-grade piano samples with 7 selectable piano models, covering a wide range of sounds. It utilises re-padling technology to create ultra-realistic reproductions of string behaviour resulting in incredible realism. The compact design makes the Keystation highly portable, allowing you to take your controller with you on the move. It is also class-compliant and USB powered class-compliant meaning you don’t need to install any additional drivers. You can also connect your Keystation to your iOS-compatible devices via the Apple Lightning to USB Camera Adapter (sold separately). The controller also includes a range of connectivity including a 1/4-inch (6.3mm) sustain pedal input for adding an external pedal for added expression. A Kensington security lock is also included as well as a 2-way power switch for turning off your instrument when not in use. This can be highly useful for live performances.